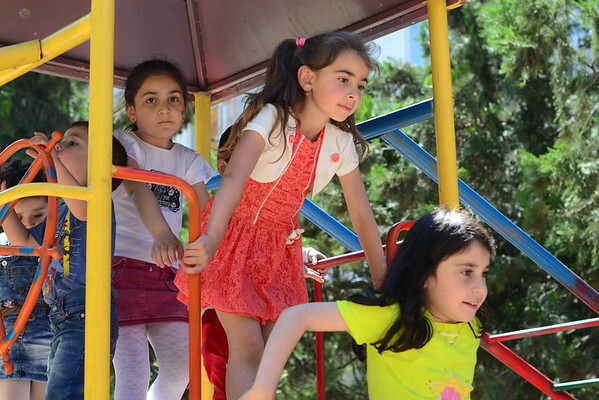 We are happy to share with you some of our photos from International Children’s Day, which FAR staff happily celebrated with children in Berd City and the surrounding villages of Tavush Province. Staff from FAR’s Breaking the Cycle of Poverty Program (BCPP) helped to organize the traditional and long awaited chalk art contest entitled “My Beautiful Homeland,” in which 50 children took part and received certificates of participation. Nearly all of BCPP’s hobby groups also participated in the exhibitions organized for the day; kids presented their handicrafts, woodwork and paintings. Children from the dancing groups of Tavush and Varagavan villages also participated in the concert held for the special day, adding to the joy and spirit of the holiday. The day was also extra special as it was the opening of Berd’s new playground, which was made possible by Ayo!